In Episode 6 of Pantisocracy (aired during a Halloween daytime slot of 2pm, Monday October 31st), Panti’s guests in her chamber in this show were novelist John Boyne, (author of The Boy in the Striped Pyjamas), Amanullah De Sondy, Senior Lecturer in Contemporary Islam University College Cork, Sligo based Illustrator Annie West, singer Hozier and the actor and singer Bronagh Gallagher. Bronagh offers a song to the cabaret with a performance of ‘Hand on My Heart’ and Hozier sings his song ‘To Be Alone’. As ever, more information and additional content is available at pantisocracy.ie. We’re also delighted to be able to announce that Episode 7 of #Pantisocracy will be broadcast on Christmas Day at 6pm! Panti’s monologue might be elevated to the status of our very own Queen’s Speech. Full details of the episode’s guests will be confirmed shortly so stay tuned. Hozier performing ‘To Be Alone’ from Pantisocracy – Episode 6 from Athena Media on Vimeo. 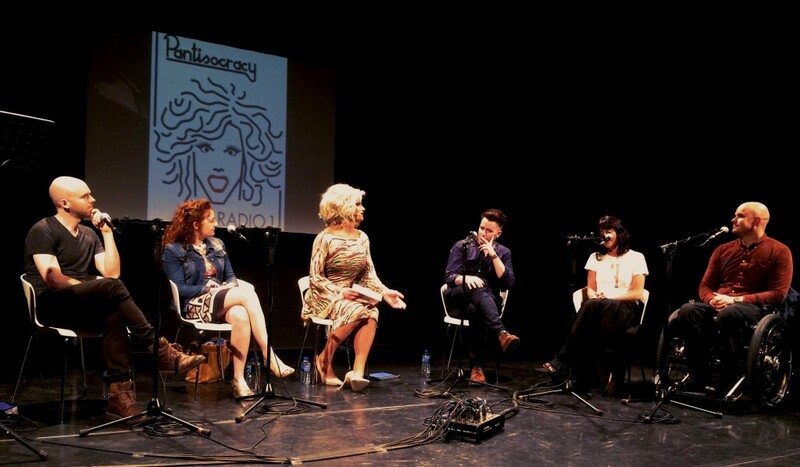 Pantisocracy – Panti Bliss hosts a late night cabaret of conversations with, and about, contemporary Ireland. In this series the Queen of Ireland Panti Bliss invites a diverse gathering of intriguing, high profile and articulate guests into her parlour to chat about their life’s journey and share stories.. From singers to scientists, athletes to actors, writers to rebels – all are citizens of the Pantisocracy where Panti herself holds court in a wry and incisive programme combining talk, song and performance. A cabaret for the times we live in. Pantisocracy is a society of equals. Pantisocracy: Episode 3 Turning Points airs Tuesday September 6th at 10pm on RTÉ Radio 1 with Episodes 1 and 2 available as podcasts. In this episode, her guests talking of turning points in life are Mark Pollock, the blind now paralysed adventurer who is exploring ways to walk again. Lawyer Simone George, Mark’s partner, is in the mix talking about her journey to make Ireland safer for women and scientist Dr. Niamh Shaw talks of her dream of going into space. Comedian Jarlath Regan shares what he has discovered in making his hit podcast “An Irishman Abroad’ while composer Michael Gallen, the lead singer with the band Ana Gog, talks about his new opera project, A Month in the Lock, and sings from the James Connolly songbook ‘We Only Want the Earth’.